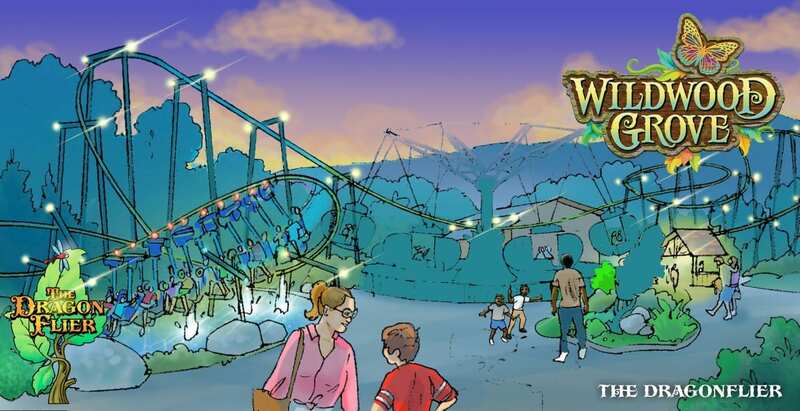 Dollywood’s newest land will feature 11 experiences for guests, comprised of six unique ride attractions, including a suspended family roller coaster called The Dragonflier, the 55 ft. tall Wildwood Tree, live entertainment, various indoor and outdoor play areas for families to enjoy, a new restaurant and more. Guests will enter Wildwood Grove through the massive hollow trunk of a fallen tree. The Wildwood Tree serves as the centerpiece of the area. It grows from a cluster of natural rock and boulders, and offers a natural platform for performances throughout the day and night. The green, leafy canopy is adorned with thousands of butterflies that dance in the breeze. As the sun sinks in the sky, Wildwood Grove glows warmly as lanterns and lights glimmer like fireflies. Once darkness falls, the area sparkles as the Wildwood Tree comes to life each evening in a unique nighttime show that features the butterflies glowing in a kaleidoscope of color. 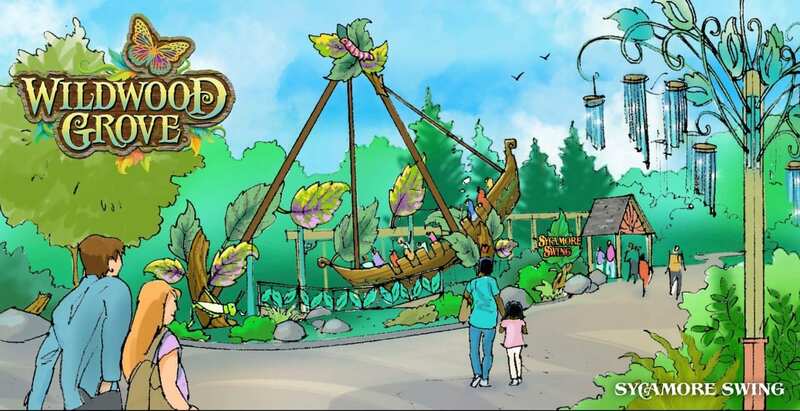 • The Dragonflier— This suspended roller coaster lets guests soar with a dragonfly as it dips and darts along the gushing geysers and lush landscape of Wildwood Grove. • Black Bear Trail— Riders hop on the back of these friendly bears for a spirited trek through their natural habitat. Families will enjoy meandering through the woods of this unique Smoky Mountain experience. • Sycamore Swing— Guests aboard this thrilling “leaf boat” swing back and forth just like a leaf falling from a giant sycamore tree. • Treetop Tower— This family tower gives guests a sky-high view of Wildwood Grove as they soar nearly 40 feet in the air. Riders, seated inside giant acorns, spin around the top of a tall oak tree before gently drifting back to the grove floor. • The Mad Mockingbird— Tennessee’s state bird—the mockingbird—gives visitors a lift as it flies in a high speed circle around a tall tree. Riders control their ride experience by moving a sail as the birds rush above the ground. • Frogs and Fireflies—These friendly frogs hop up and down as they chase each other around the lily pad trying to catch the flickering fireflies fluttering from the tall reeds and grasses. Adventurous guests can hop aboard for this riveting race. Hidden Hollow, a 4,000 sq. ft. indoor play space, provides a climate-controlled area for families looking to recharge before their next big adventure. With climbing structures, slides and multiple games, play time here is full of exploration. Another stop for play is at Wildwood Creek where numerous pop jets, splashing pools and more await. There, guests also can discover their musical side thanks to the various “instruments” available to play. Several new characters await guests to the area. In the tradition of the Wildwood butterflies before them, Flit and Flutter—Wildwood Grove’s butterfly ambassadors of beauty and grace—dutifully watch over the Wildwood Tree. While each has their own distinct personality, both Flit and Flutter enjoy interacting with visitors to Wildwood Grove. Guests also can meet Benjamin Bear, a playful friend who loves to explore the grove with new visitors. Wildwood Grove’s featured dining establishment, named Till & Harvest, offers another option from Dollywood’s award-winning foods team. Visitors can order from a selection of Southwest fresh favorites, including burritos, salads and more, all with a Southern twist. In addition to traditional entrees and a topping bar with assorted salsas, guests can add items like pulled pork and fresh coleslaw to their selections. A walk-up window provides sweet treats like churros and ice cream. 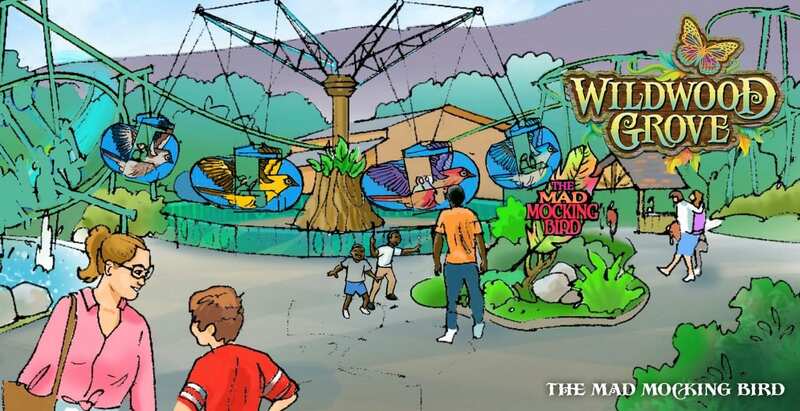 The Dollywood Company President Craig Ross said, “I think our guests are going to be excited about the diverse combination of attractions they will find in Wildwood Grove,” Ross said. 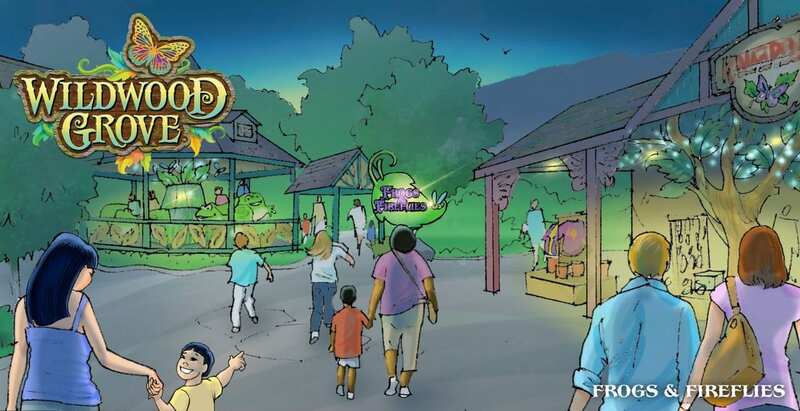 “It continues our commitment to provide guests a variety of unique experiences and attractions that every visitor to the park can enjoy. We’ve also incorporated many of their requests for certain amenities that help make their visit more enjoyable. In Wildwood Grove, you’ll find more charging stations, a climate-controlled indoor space for play, larger respite locations, additional play areas which are more inclusive for everyone, and more entertainment opportunities for every member of the family. 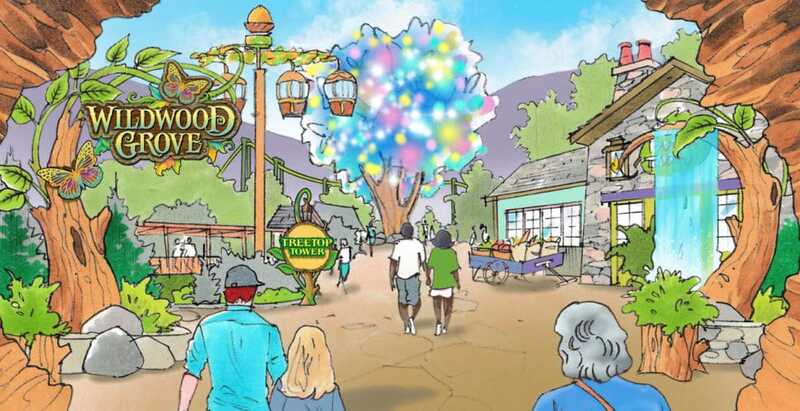 Wildwood Grove will be largest capital investment in Dollywood’s 32-year history. Nearly $1 million has been planned for landscaping the area, with more than 400 trees and 1,000 shrubs helping transform this space into a lush and relaxing spot hidden within the foothills of the Smokies. 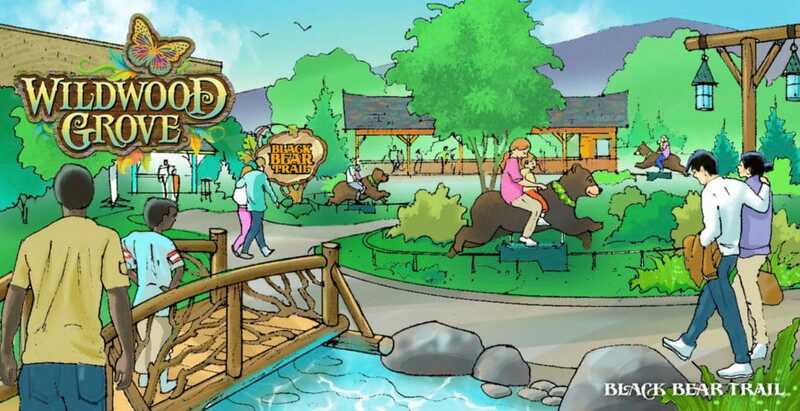 The total cost for the project is $37 million, meeting The Dollywood Company’s 2013 commitment of $300 million in investments over a 10 year period four years ahead of schedule.